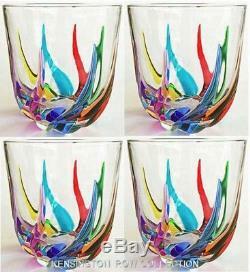 "VENETIAN CARNEVALE" STEMLESS WINE / OLD FASHIONED GLASSES - SET OF FOUR Our brilliantly hued stemless wine/old fashion glasses are crafted in Italy of cut crystal and beautifully hand painted by master Venetian artisans in a rainbow of colors. Each glass holds approximately 13.25 oz. Measures approximately: 3.75"H x 3.5" Diameter. The item "VENETIAN CARNEVALE STEMLESS WINE GLASSES / OLD FASHIONED GLASSES SET OF FOUR" is in sale since Sunday, October 23, 2016. This item is in the category "Home & Garden\Kitchen, Dining & Bar\Glassware". The seller is "kensingtonrowcollection" and is located in Sister Bay, Wisconsin. This item can be shipped to United States, Canada, United Kingdom, Denmark, Romania, Slovakia, Bulgaria, Czech republic, Finland, Hungary, Latvia, Lithuania, Malta, Estonia, Australia, Greece, Portugal, Cyprus, Slovenia, Japan, China, Sweden, South Korea, Indonesia, Taiwan, Thailand, Belgium, France, Hong Kong, Ireland, Netherlands, Poland, Spain, Italy, Germany, Austria, Bahamas, Israel, Mexico, New Zealand, Philippines, Singapore, Switzerland, Norway, Saudi arabia, Ukraine, United arab emirates, Qatar, Kuwait, Bahrain, Croatia, Malaysia, Brazil, Chile, Colombia, Costa rica, Dominican republic, Panama, Trinidad and tobago, Guatemala, El salvador, Honduras, Jamaica, Antigua and barbuda, Aruba, Belize, Dominica, Grenada, Saint kitts and nevis, Saint lucia, Montserrat, Turks and caicos islands, Barbados, Bangladesh, Bermuda, Brunei darussalam, Bolivia, Ecuador, French guiana, Guernsey, Gibraltar, Guadeloupe, Iceland, Jersey, Jordan, Cambodia, Cayman islands, Liechtenstein, Sri lanka, Luxembourg, Monaco, Macao, Martinique, Maldives, Nicaragua, Oman, Peru, Pakistan, Paraguay, Viet nam.